Last year, Lee Isaac Chung made a full-length feature film of Gerald Stern's poem Lucky Life. Here is a charming 4-part interview with Chung, which is at once personal and honest and insightful. If you missed last Friday's post with the short film on Gerald Stern, you can check it out here. In 1960 boisterous spectators created a major disturbance, and the National Guard was called to the scene. Word that the disturbances had meant the end of the festival, following the Sunday afternoon blues presentation headlined by Muddy Waters, reached poet Langston Hughes, who was in a meeting on the festival grounds. 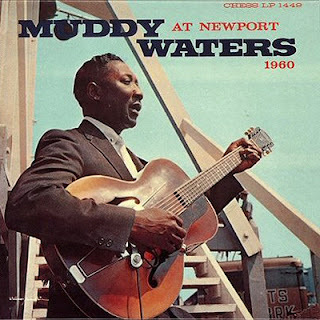 Hughes wrote an impromptu lyric, "Goodbye Newport Blues," that he brought to the Waters band onstage, announcing their likewise impromptu musical performance of the piece himself, before Waters pianist Otis Spann led the band and sang the Hughes poem. Newport Jazz Festival, Wikipedia. Herein, some misc items, seen around the web and in print, for your perusal while I knuckle under, working on the 4 presentations I have to do in the next 8 or so weeks: they are specifically on haiku, Robert Frost, Robinson Jeffers, and, for work, customer service as a vocation or a way. 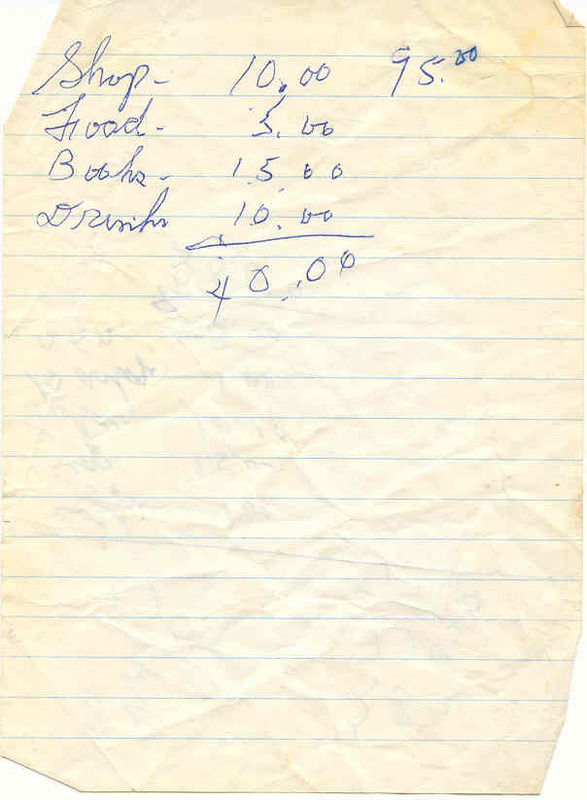 This first item, found in an old paperback copy of a horror novel I picked up probably 10 years ago, shows a shopper, on a meager (probably early 70's) budget, who has her priorities straight: Books, Drinks, Shop, and Food. 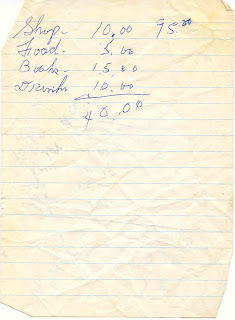 We can only hope that the remaining $45 was as wisely allotted. "Poetry and surety claims aren't as unlikely a combination as they may seem," observed Wallace Stevens. Here is the short film, in three parts, on the magnificent Gerald Stern, entitled Still Burning. He has a brand new volume, Early Collected Poems, 1965-1992, which contains the books, Rejoicings, Lucky Life, The Red Coal, Paradise Poems, Lovesick, and Bread Without Sugar, his first six. It not only contains some of the best, most accessible, heartrending American poems of the 2nd half of the 20th century, but it is dedicated "To the Sorrowful." To complement the Stern film, an interview with his old pal, Jack Gilbert, another fine poet, from the Paris Review. This [collection] is not elevated tragedy or even the more familiar fissures of domestic drama but the stoic-melancholy vision of W. H. Auden, for whom "the crack in the teacup opens / a lane to the land of the dead." And the first love of the world." And the diver's brilliant bow. And wonder what you've missed. With all your crooked heart." Here's a 49 second visualization of the haiku by Moritake, "drifting back to the branch:"
This week's feature poem from the archive comes from Lilliput Review #132, July 2003. Enjoy. Yet Tobacco Road's cultural reach—thanks in part to a folksy Broadway version of the novel—is long and complicated. You can trace the intensity of Caldwell's vision in Tobacco Road right up through the undervalued and largely out-of-print novels of Harry Crews, and even through those of—though it is mildly heretical to say this—Cormac McCarthy. Without Tobacco Road, it's almost impossible to imagine the arrival of Hee-Haw and The Beverly Hillbillies, not to mention Deliverance. within two graphs. He notes that Faulkner and Cowley admired it and Saul Bellow thought Caldwell should have gotten the Nobel Prize. The roller-coaster effect is duly noted. The Blues Magoos are something else again. Their influence on bands to come might justifiably be compared to Caldwell's above - this is a band that put the g in garage and p in punk, at least in terms of who listened and learned. 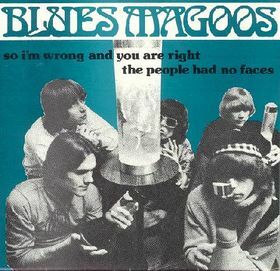 A staple of psychedelic 60's compilations and charter members of the Farfisa Hall of Fame, this band may qualify as the first professional rock band I ever saw: they played a mixer at my high school. While looking around for a live version of the Magoos best known song, "We Ain't Got Nothin' Yet" (or really anything live from the 60's - there was a lot of lip-psyching going on back then), I stumbled on this live performance of "Tobacco Road," introduced by Jack Benny. When the song ends, Benny comes back and does a routine with the band that is so painful it just can't be missed. 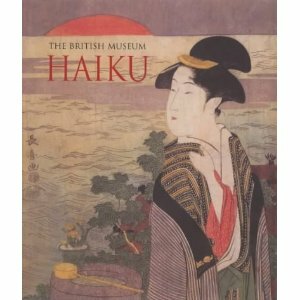 A few years back while in London, I purchased a beautiful little haiku book at the British Museum simply entitled The British Museum: Haiku. You will see, however, that the title of this post is Haiku: The Poetry of Nature and you would be correct to wonder why. So, all you marketing wizards out there: what's up with this? I've thought about it and it just breaks my brain and, frankly, for awhile caused me some considerable confusion. Why confusion? Well, while browsing at the library, I ran into the 1st copy pictured above and spent some lunch hours pouring over the poems and incredible illustrations from the British Museum collection. I jotted down some notes to consult the copy I knew I had at home so I could pull together some things to share in this post. One can know the main facts about Japanese haiku without having much feeling for them; and one can feel quite deeply about haiku without knowing many facts - intuition sometimes supplies important insights. A great opening for a decorative, gift-bookey looking item, with gorgeous British Museum reproductions. Who'd a thunk it'd have a spine (sewn, too)? In the acknowledgments by editor David Cobb it is noted that many of the translations are by R. H. Blyth, some of which Cobb and his partner, Sakaguchi Akiko, received permission from Hokuseido Press "to edit [them] to a more contemporary standard of layout and punctuation." This carefully prepared statement says nothing about changing the words of Blyth's translations, which may be some consolation for traditionalists. Blyth's indenting has been abandoned with all the poems left justified. In addition to Blyth, 7 other translators are represented in the collection, including 5 poems rendered by Makoto Ueda, with the remainder translated by Cobb. Of the 71 poems presented, I noted 19 or so for further inspection. Why the or so? Sometimes, when I'm not sure, I simply put a question mark so I'll return to the poem to see what I think later. 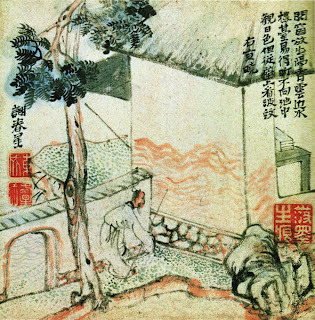 In addition to the poems, every page has a facing classical artwork, some running over onto the poem page, taken from scrolls, wood block prints, and books. The paper is heavy, the binding sewn, as noted above, and the colors of the prints are fine. Both of these poems address the kinds of thoughts the ocean evokes. The first has deeper philosophical implications; it reminds me of a wonderful Peggy Heinrich haiku I reprinted recently ("ebb tide / turning to look back / at my footprints"), both poems being reflections of past and possibly future things, in the present moment. Not quite the "being there" of the Buddhist moment but it is being everywhere in the momet, if you will. The 2nd haiku treats another common feeling at land's end, the sense of loneliness and the feeling of being very small in the larger context of things. I'd almost prefer the poem without the first line, though in either case it reminds one of the basic sadness that seems to underlie all things. Anyone who has played any competitive sport on their own knows this feeling. There probably is nothing more solitary than hitting a baseball alone and chasing it, or throwing a ball up in the air continually with no one there to catch it but yourself. The feeling reminds us very sharply what we are missing. The whole poem rides on whatever it is that is buckling. Certainly the reader knows what the buckling is an allusion to. Is it a runner the narrator sees or the narrator herself who buckles? Is it an illusion, as heat shimmering off pavement, creating an appearance of buckling, recalling that other buckling? I'm at a loss but the mood is both mysterious and haunting. The reason for the quotes around unread is that I've read the complete Bashō via Jane Reichold and I don't recall this one. Hardly surprising, I guess, since there are so many radically different renderings of classical poems but, still, you'd think I'd have even a tiny clue. In any case, I really like this haiku for many reasons, not the least of which is that this thick-minded Westerner now senses the visceral reason for the many rice singing haiku of Issa. Longer versions of this poem tend to emphasize the moon's journeying as well as the narrator's all-night rambling - the implication is there in the simple version and anything additional is really superfluous. The colon says it all, performing the function of the cutting word in the original Japanese and very clearly emphasizing the comparison conjured by the poem's dichotomy. Just a perfect little poem with cosmic qualities that are at once lyrical and scientific. Issa recounts in haiku lots of instances of saving grasshoppers, ants, and flies from being trampled so here is an ironical turn. Thinking on Issa's other two poems about dew recently highlighted in a post and how dew seems to represent the ephemeral nature of life, there is much resonance in this little piece, again masterfully translated by Blyth. I can hear those 4 volumes of Blyth's calling me as I type. The first haiku reminds me of Issa's poem "as it falls / the peony lets drop the rain / of yesterday," or if stated in the proper order, Issa's should remind us of Bashō's. In one case the precipitation doesn't drop, in the other it does. Though these pieces are imagistic and beautiful in their own right, they also remind us of the interconnectedness of all things. Beyond that, Kyoshi's poem is deeply moving, rendered as it is by Makoto Ueda. In this case, everything hinges on the single word autumn, in its placement and its implications. There is almost a sense that the word said and repeated is "autumn," though admittedly that seems a stretch. Still, if that isn't the word(s), its meaning and implication is clearly what the topic of conversation is about. A beautiful, stunning haiku, certainly. This is a poem about movement, about travel, and, I imagine, also about sound, perhaps as it fades into the distance. There is a blending, perhaps, of the two sounds as they move away. 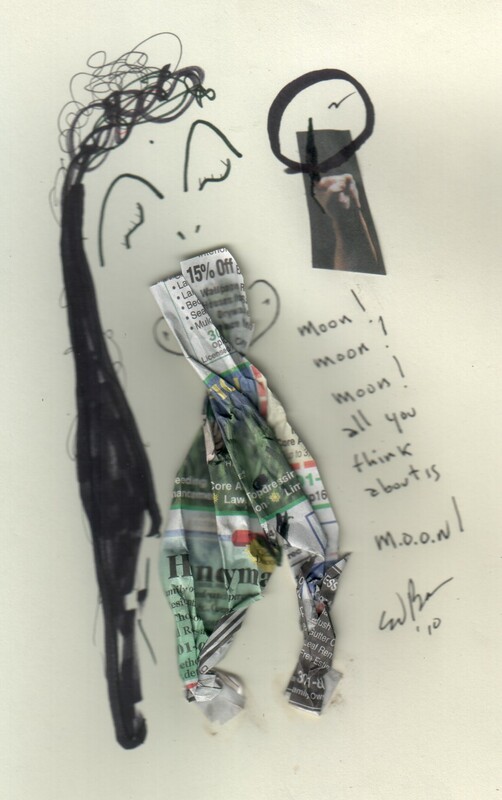 Mr. Blyth is a master translator and, like a master painter, sketches in a few brief brushstrokes a world entire. Indeed. We are right now at the beginning of autumn in the Northern hemisphere and we know what that means. There is a fine humor here, though the macabre is not very deep below the surface. Some of the previous poems prepare the reader for the full implications of this poem. Autumn is the season of ending, the season of dying, and we all must walk on fallen leaves to do what we are doing and arrive where we all arrive. "No escaping it." The first and third poems are familiar but the placement of them together really underscores their difference as much as their similarity. "A sudden squall" has Buson's painterly quality, while "the sea darkens" utilizes the technique of synesthesia I touched upon in a recent post on Issa, which adds a whole other dimension to the scene. The intensity of the storm in "the angler" dovetails nicely with the fisherman's own intensity and conjures the picture rather than paints it, which would be Buson's usual approach. All three together like this remind the reader of Japan's island culture and dependence upon the sea. Hino Sojo was born in Ueno, Taito, Tokyo township. During studies in law from Kyoto University, he called the common Haiku Society of the University and the third high school to life. In 1924 he graduated and became a clerk. As a haiku poet he was trained at the Takahama Kyoshi literary magazine edited by drew at the age of 21 years of attention, as written by him to Haiku on the first page of Hototogisu reached. 1929, at the age of 28, he was finally included in the fixed circle of the magazine. 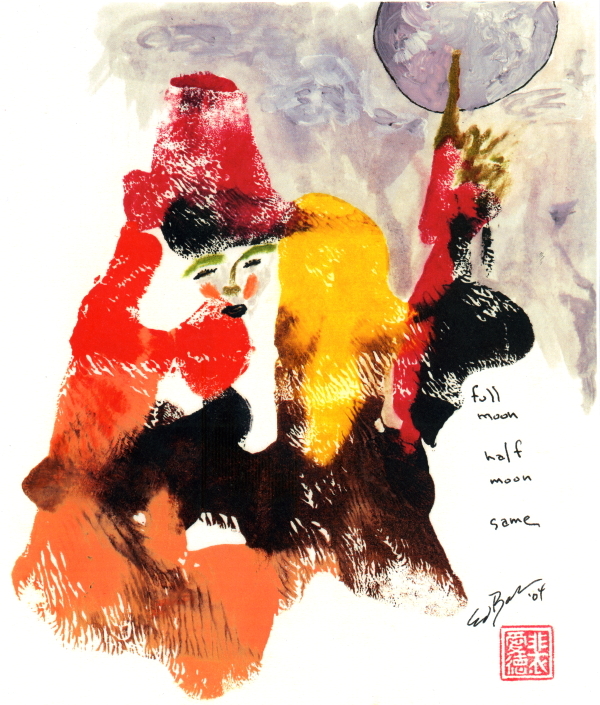 In 1934 he published in the journal Haikukenkyū (俳 句 研究, GV "Haiku-research") the haiku Miyako Hoteru cycle, in which he first wedding night of two newly weds, described, and thus sent a shock wave through the world of haiku poetry. It acted Although this is a purely fictional story, but this gave rise to the so-called Miyako Hoteru dispute in which Kusatao Nakamura and Kubota Mantaro practiced sharp criticism Saisei Murō contrast, appeared as counsel. 1935 brought together the three journals Sojo somato from Tokyo, Osaka and from Seiryō Hiyodori from Kobe and founded the new journal KIKAN, of which he became. He called for a modern form of haiku without words and broke so final season with the conservative Takahama Kyoshi, which excluded him in 1936 from among the Hototogisu. 1949, after the Second World War, Sojo went to Ikeda (Osaka) and founded the magazine Seigen. 29 January 1956 Hino Sojo died as a result of tuberculosis disease, by which he had been since 1946 on his sick bed. Besides emphasizing how horrible machine translation is (and providing the occasional howler), this translation does give up some intriguing details. I am fascinated in his proposal of a poetic form of "haiku without words" (not only no finger, but no moon!). The first garbled sentence is very perplexing - if anybody's got a clue, I'd appreciate it. The haiku itself, "the one eye sightless," has a quality which gives a glimpse into the quirks of human nature. There is humor, sadness, and I think a sense of human resilience that makes this poem special. Overall, this is a collection that may be visited again and again, with some fine translations and excellent art. Though I don't link to amazon, there are quite a few copies available there for 46 cents and up. I do link to abebooks and you will find excellent copies there for even less when you factor in the amazon shipping. Very good and fine copies for $3.97 and $4.00 respectively, beating amazon out by 50 cents. This week's feature poem from the Lilliput archive comes from #133, October 2003. Enjoy. the meaning of the wind. This incredible little short film was put together by Mike Hazzard of "The Center for International Education" out of St. Paul, Minnesota, the organization responsible for the film "The Poetry and Life of Cold Mountain," a clip from which was featured in a previous post. Created by 25 students from grades 1 through 8 at the Capital Hill School in St. Paul and they are magnificent. Kids, as always, cut through the nonsense (a/ka/ my typical posts) and get right to the core of haiku. I got misty, I laughed out loud, I loved this little film. I ordered it from CIE and plan to use it in this fall's haiku class for seniors. 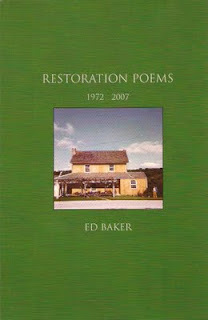 I first ran across it at the site "Moving Poems" and traced it back to the CIE site for more info and to place an order. Though this youtube video is the film in its entirety, supporting CIE seemed a great thing to do. Guess those 500 songs must mean 500 "rock songs" cause, well, the Cole Porter and Irving Berlin seem to be missing. Lou Reed has told the story that the song originated from a supposed planned musical of the Nelson Algren classic novel of the same name. A novel about the down and out, the alienated and alone, A Walk on the Wild Side, along with The Man With the Golden Arm, cemented Algren's reputation as an important mid-20th century American novelist. About Walk, Algren noted, "The book asks why lost people sometimes develop into greater human beings than those who have never been lost in their whole lives." The New Orleans down and out are the direct antecedents for Reed's cast of NYC's disaffected, a group that comprise some of the most memorable ever portrayed in a rock and roll song. Of course, there is nothing new in the world - one only need look to the Satyricon of Petronius Arbiter to find a slightly earlier versions of Algren and Reed's powerful characters. 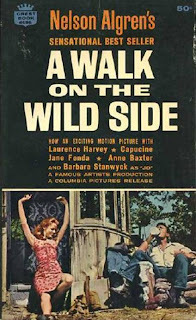 Here is the amazing title sequence from the 1961 film adaptation of Walk on the Wild Side. An exquisite use of black and white (the cat's shadow as it walks in the opening moments is astounding) and visual metaphor. This week's featured poem comes from Lilliput Review #103, April 1999. Ray Major passes the word: instructions are optional. The size of the pot and how much water. And see that for the miracle it is. 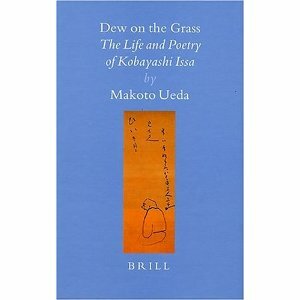 Makoto Ueda, the author of Matsuo Bashō: the Master Haiku Poet (while searching for this link, I found this example of a google books scan gone kerfuffle) and Bashō and His Interpreters among other seminal works on Japanese poetry, wrote a book on Issa entitled Dew on the Grass: The Life and Poetry of Kobayashi Issa that some folks know about and not enough have seen. Fortunately, my library has a copy so I have gotten to see it. There are 15 copies available via amazon.com, both used and new, starting at $129. There are 11 copies available via abebooks at the lower rate of $105. Evidently books from Brill's Japanese Studies Library are priced liked this right from the get-go. Welcome to the world of Haiku Academia. If anyone's analysis is worth this kind of dough, it is Makoto Ueda. His biography of Bashō is a master work and belongs on the shelf of any serious student of haiku. I am looking forward to settling in with Dew on the Grass sometime in the near future. In the interim, I did get the opportunity to read the 200 plus translations that Makoto Ueda has provided in Dew. It is always a great pleasure to find new translations from the vast store of 20,000 plus haiku Issa wrote. Despite such a large body of work, we often read the same relatively small set of poems translated again and again. We are regularly reminded by the experts that Issa wrote a lot of mediocre verse; anyone who has spent time exploring David G. Lanoue excellent massive database of Issa's poems (or has signed up for his "Issa Haiku-a-Day" email service as I have) knows there is some truth to this statement. It is amazing to me that anyone could write 30, 40, 50 or even more poems that survive for posterity; Issa has certainly done that and, as such, will forever be a pillar of the haiku canon. Think of the volumes and volumes of verse by the great poets of all countries and persuasions from which we remember a handful to a dozen poems at best and we realize what an accomplishment this is, not in spite of all their bad verse, but because of it. Think of all the mediocre cabinets the master cabinet makers built before they excelled in their trade. Here are 19 poems that got my attention in Dew. I've tried to highlight ones I've never seen rendered before, though there are the occasionally familiar poems that I couldn't resist since they reveal new dimensions in Makoto Ueda's astute translations. I also recalled a couple of poems while reading these, which I transcribed from memory, that felt related in either subject or mood. Ever honest, Issa tells it like it is. Evidently, from the phrasing he seems to be watching someone (or perhaps others) at dinner or a festival digging in with relish and recognizes their humanity in himself. This is a haiku that has been translated before and is one of Issa's most important. The significance of the cherry blossom in Japanese culture can hardly be over emphasized. Though Westerners see the beauty in them, they don't necessarily contemplate the full implication, the wabi-sabi, of the tradition of cherry blossom viewing. Here Issa reminds us that in the cherry blossom we see how very brief life is, whether measured in mere days, as with the blossoms, or years or decades. Beautiful and transient, lovely with a deep shade of sadness, the cherry blossoms touch the soul. Haiku often have two distinct parts, which the poet uses for contrast and comparison. Sometimes, the link is not apparent and this is when we must feel or sense what the poet is after. Beauty and loneliness, like beauty and transience, are in contrast here and the messages are related. To paraphrase Issa's famous death verse ("a bath when you're born / a bath when you die / how stupid! "), you're born alone, you die alone, how poignant. I pulled up when I read this one. The imagistic style of Buson immediately comes to mind. 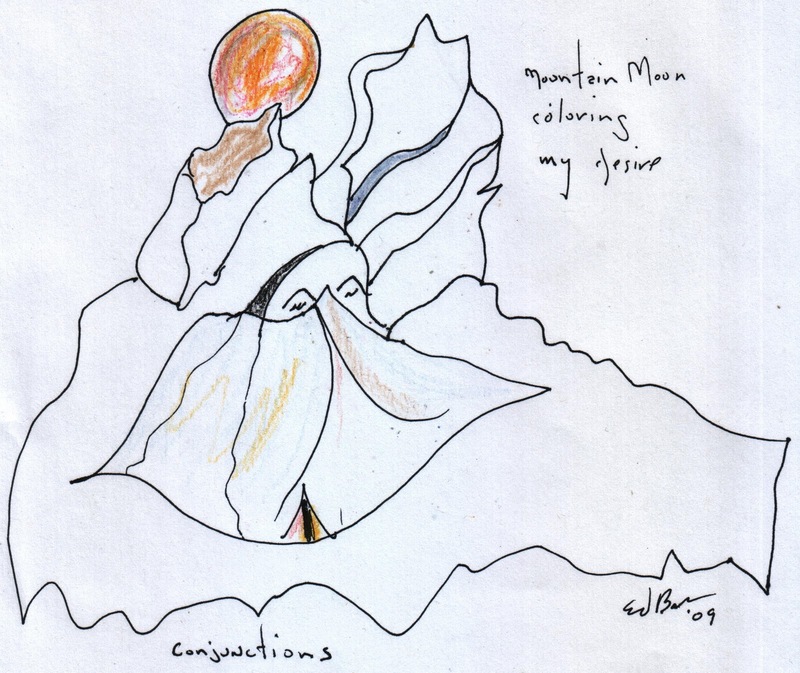 This feels as if the moment truly wrote the poem, evoking the idea of synesthesia, a common enough stylistic device with Buson and even Bashō . The cicadas in Pittsburgh were certainly bright red this summer. Well, Master Issa always likes to have his bit of fun and here it is. High art? Maybe not. Pointless? Definitely not. Humor in Issa is of great importance. If the loneliness highlighted by wild violets is almost unbearable, the stupidity of life itself maddening, the sadness of cherry blossoms overwhelming, the humor of life is all-important. Humor in fact is the answer for many a great philosopher and the refuge of the humble. Plus, this just must have been a moment to see! This seems slightly different than Issa's poems about swatting mosquitoes while praying to Buddha or sending a mosquito off to its next incarnation. The sentiment is there; the contrast of praying and killing is one that speaks to the essence of human nature. So many wars are waged in the name of major religions. today is the last time! This poem written at his father's death is deeply moving; to be thinking this during the very moments of dying evokes at once the sadness and prescience which can be so often muddled in the rush of emotions surrounding the death experience. Another poem that caught me by surprise from Issa and one I have no idea about. It feels as if there is some cultural implication that I'm unaware of, yet the image is striking enough to be moving in itself. The act of creation here is portrayed as fleeting as the season itself, the creator truly seeing the work in the larger context. 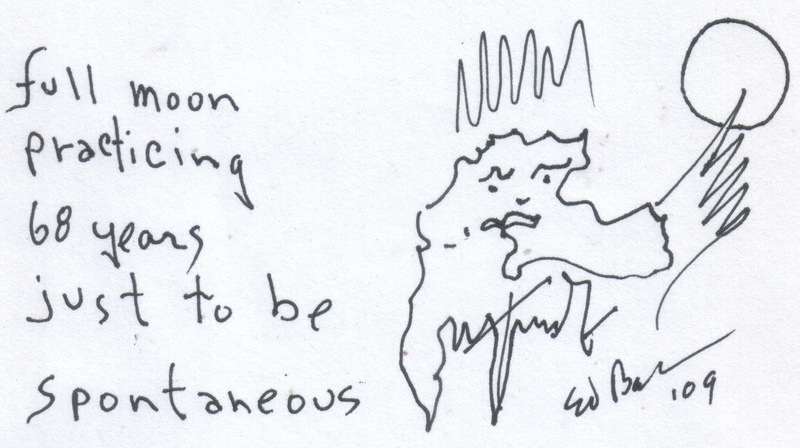 Art, too, is transient. Makota Ueda nails this one which I've seen translated a variety of ways. The peony has held the water for a day, since yesterday's rain, and the moment when the weight overwhelms the flower captures in miniature the cycle of all things. Again, this is a familiar haiku that is extremely evocative in Makota Ueda's translation. It all turns on the word "scars," which I don't ever recall seeing previously in the context of this poem. Truly a perfect poem, dovetailing as it does philosophy and lyricism. There are a number of poems about the Milky Way (Heaven's River) in this collection, ones that have been variously rendered by well-known translators. This one, however, is new to me and quintessentially Issa. Even in the great pattern of the stars, the Milky Way, Issa spots the loner that he identifies with, just as he does with lone sparrows and bugs. Here is a philosophical poem with highly charged emotional and psychological underpinnings. This from the same poet who gave us "The world of dew / is a world of dew ... / and yet, and yet ...," written on the death of his daughter. There is a very real, very powerful connection between these two poems, if I'm not sorely mistaken. "The world of dew" is almost universally present in selections of Issa's work; I've never seen any version of "life on earth" that I know of. There is nothing more transitory than dew, which is what brings such force to "The world of dew" haiku. The world is simply a world of dew, "but a moment's sunlight, fading in the grass," and yet, and yet ... is there something else? It is a wish one suspects Issa sorrowfully doubts, which gives the poem its pathos. By the same token, that very doubt is what gives strength to "life on earth." Another traditional senryu/haiku, not very typical of Issa - but so wonderful. The massive sumo wrestler's respect for delicate new grass is poignant in apparent contrast with his profession. Perhaps there is a hint here of sumo's origins in Shinto religion and observance. This seems to be all about ownership or, more precisely, not about ownership. Nature in Issa's work is about interacting, no laying back and observing here. My guess is that our protagonists talked this one out. It takes but a single leaf for Issa to tell exactly how cold and desolate he feels this late autumn night. There have been other versions of this poem that I have seen and enjoyed but this one sidesteps an overt comparison of its two elements, feeling more objective in its execution. This is a favorite of mine, as are morning glories and, yes, human faces. Another haiku that is new to me. I'm not for the anthropomorphic approach in any poetic form, especially haiku. Still this gives the reader insight to what Issa feels people think about blowfish and what Issa thinks about people. Even for the lice it is a bright beautiful New Year's - from this translation it is difficult to gather the mood, but knowing Issa and his reverence for his bug menagerie, I'm thinking upbeat. This is a poem that transcends culture, language, and lyrical boundaries - to repeat 3 words in a 14 word poem, leaving only 8 to sketch it out and to compose a masterpiece of love, emotion, and longing, well, this is why Issa is Master Issa around here. The repetition breaks the heart. This week's featured poem is by Britain's David Lindley, whose fine work has appeared in Lilliput quite often, and originally appeared in #134, in October 2003. I received a number of suggestions for the Sunday Service this week and so free issues of Lilliput Review are winging their way out to folks (what's up with that?) . I thought I'd feature one of those suggestions to encourage people to keep 'em coming. 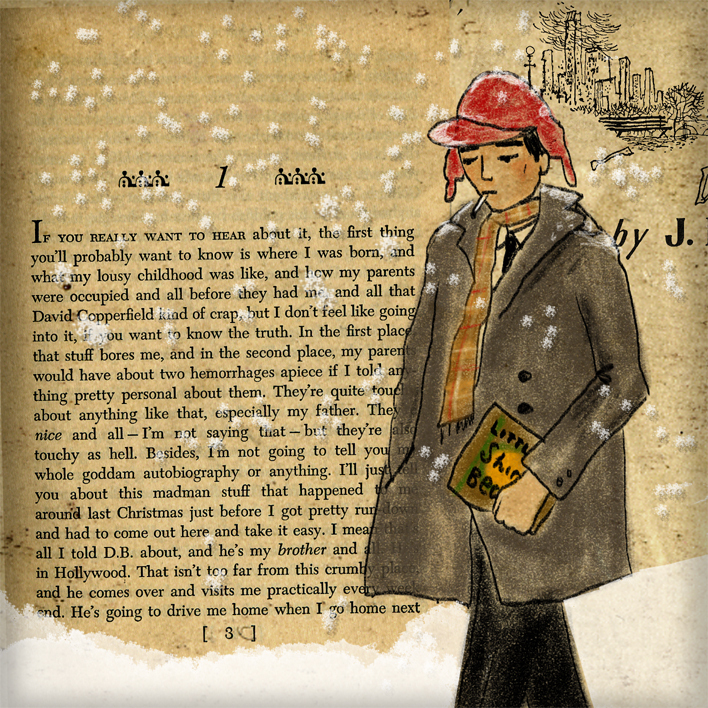 Here's is Green Day's homage to J. D. Salinger's legendary anti-hero, Holden Caulfield. 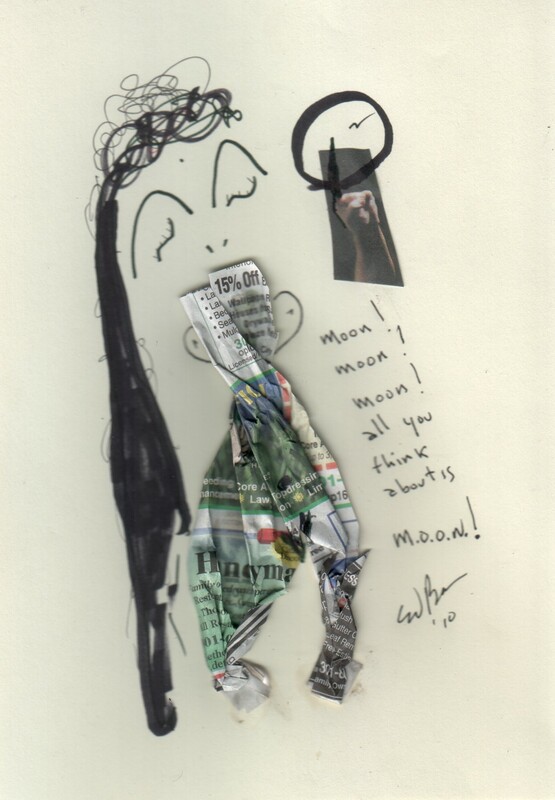 Does it capture the breadth and depth of the decrying of all things phony? Nope, not even close. 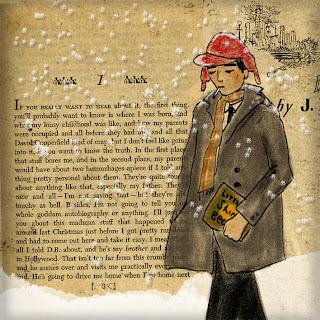 Is it a rock song, does it capture a certain something about one of literature's greatest j.d.'s? Yup, hence slack duly given. Actually, good ol' Jerome has been on our collective minds of late with this intimate bit of memorabilia going up for auction recently. Not up your street, you say? Well, along with the above song, here is a nicely energized live version to take away all the nasty thoughts. Sort of . Today's feature poem comes from Lilliput Review, #101, January 1999. Touched as it is by memory, it's an appropriate end of summer poem. Enjoy. 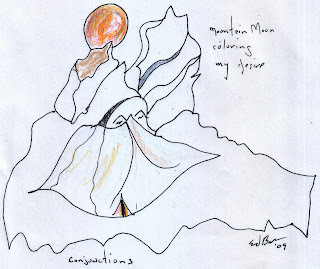 Buson, known as the artistic or painterly poet among the haiku masters, is a master of precision. Reading through Robert Hass's renderings of Buson, I've been most impressed by two things: the concision Hass manages to use with Buson, to great effect, and Buson's own intense concentration on the moment. The later point connects Buson to the verse in a spiritual way that is often marginalized when considering his work. 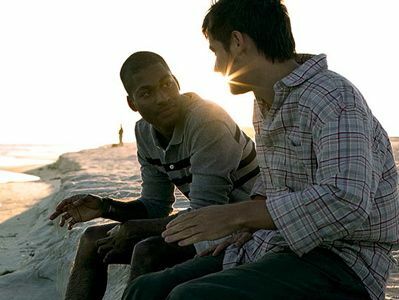 Of course, we all share the moment, atheist and believer alike, which is a simple truth. However, we don't all necessarily live in it or celebrate it and, though the present moment is one of the tenets of fine haiku, in I didn't expect it to manifest itself to quite the degree it does in Buson's work. Some of what I've selected from Hass's translation are frequently anthologized pieces and I won't apologize for that; they are selected by many an editor for good reasons. Yet, still, there a number of poems perhaps not quite as familiar. That was certainly the case with me. 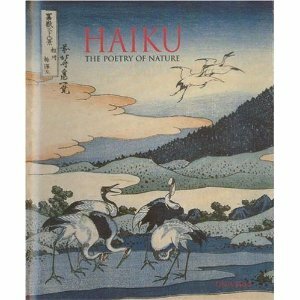 While reading up on critical approaches to haiku, one tenet proffered the question: "Where does the poem resolve, in the mind of the poet, on the page, or in the mind of the reader?" Certainly this haiku isn't spiritual in the Buddhist sense but there is deep emotion here. There will be two different autumns because the two people of the poem will be in two different places. The idea that even the season itself will be different accentuates the distance between the two friends or lovers. 6 words, one large parcel of loneliness. This is the painterly Buson who is so often mentioned. With the blossoms gone, the temple appears. There is a spiritual quality to this, ennui or sabi, if you will. The season passes, impermanence is heightened, yet, even at that, something is offered by way of a solution. Is there an acceptance here of the need to move away from attachment to attain the end of suffering? Or is it just another pretty picture? I've highlighted this particular haiku because, though one may sketch in all manner of naturalistic details to fill out a picture, the main argument here to me is philosophical. Autumn has come, winter is coming, the season of death, yet still there might be joy. What is the joy in loneliness? It is something most of us have felt and, though elusive, that joy, it is of great import. Perhaps Buson's most famous poem (here's a post on it from way back - actually, there were two), the image is powerful, because, I believe, of the implication and not the allure. Again, the word temple conjures a spiritual mood. The sleeping butterfly recalls Lao Tzu's dreaming butterfly, or the butterfly dreaming of Lao Tzu? Here the moment is captured a little bit more effectually than, for instance, in "Cherry blossoms fallen." The problem with the later may be the tense of the rendering. This is painterly, indeed, and the image may overwhelm the message, yet still there is a message. It is the passage of time and seasons, as the flowers of spring and summer flow down in winter into the river that, in a way, reminds me of Issa's wonderful insects on a branch, floating down river, singing. This is, as rendered, is a potent piece. The minimalist approach puts all the weight on the swing or gate word, frightening, which modifies both the opening and closing line, and, standing alone, as one imagines the speaker in the forest, becomes very powerful, indeed. Fear is not often the subject of classical haiku and rightly so. Normally, the exact same scene is sketched quite differently, a quiet, serene country scene. Here, though one's attention is riveted because it is too quiet, and the narrator's animal instincts take over. 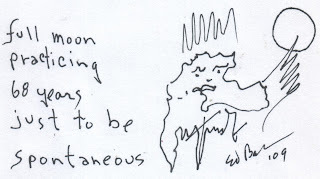 Negative as it is, still, it is one of my favorite Buson haiku. This is, perhaps, too imagistic but, having lived a long time by the sea, it does have a certain romantic appeal. Dipping a little beneath the surface, one discerns a classic theme of human being versus nature and, per usual, human loses again, as the moon escapes. Yet, the poet captures the moon, among other things, and all is not lost. Or not. This may be my favorite of Buson. The pause is physical and intellectual and emotional - a beautiful picture, if conjured properly in the mind, about to become un-beautiful in the next moment. Still, the lesson of death is repeated, and beauty, too. Desire is the cause of all longing, all suffering. Yet, we repeat the cycle no matter how many times we learn the lesson. the quiet of the peony. Once again, philosophy and art meet each other halfway. The poem, perfectly balanced on the fulcrum of its second line, eventually tilts toward the silence that is its resolution. Without noise, there is no silence, so we are truly "in between." What tilts it for me, you ask? Well, the poem might be rendered "The quiet of the peony - / in between / people visiting all day." In meditation, it is silence which informs the sounds of life and all its complications. Truly, it is the balance we need; there is no yang without ying. Pretty as one might find the poem, its message is every bit as potent as its beauty. The poet, like everyone else, needs no church or temple to be religious. The way which may be walked is not the eternal way. This is, indeed, too, painterly, yet it is exactly that quality that appeals to me. There seems to be only image, evocative as it is, without underlying spiritual or philosophic motive. What I like here is exactly what I like when seeing a great painting or reading a piece of flash fiction. I imagine the ride through nasty weather, in any emergency or an important meeting or a lover's tryst, the long discussion in a warm lodging while the horse patiently waits and all the color is gradually removed from the scene. This is at once what Buson is most criticized for and what he is very best at. Does it have the appeal of the layered, probing work of Bashō or emotive, resonant poems of Issa? Surely not. Does it have it's place in the world of poetry in general and haiku specifically? The last Hass rendering I'll pass on, this is another coupling of stunning image with a perfectly conjured moment. This very specific light, caught in this very specific moment, in the texture particular to white plum blossoms, is perfection itself. As to the moment: what is better, to live the moment and the moment only or simply to talk about it? As far as spirituality goes, there is no Zen. There is no plum blossom. There is no light. First, there is no mountain. Buson, I have been seduced. Mister Hass is to blame. This week's featured poem from the Lilliput Review archive comes from #135, published in January 2004. Let's make that this week's two featured poems: enjoy. to nonexistent past and future. about time, captures the essence of breath. monkey minds and one-hands clapping. 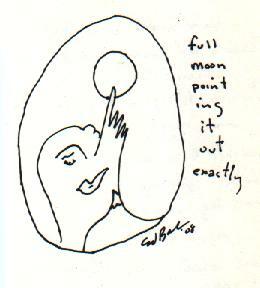 Last week, Ed Baker, poet, artist, and raconteur of the first degree, responded to the Robert Hass/Bashō post with some nifty "finger pointing" at the moon artwork which I thought I'd share. Here's a little shrine's worth. Be sure to click on the images to read all the short work that accompanies the art, fine examples as they are of haiga. Enjoy.